In 1973, Joseph Phelps, who was then running one of the largest construction companies in the U.S., bought a 600-acre cattle ranch outside St. Helena and finished building a winery on the property in time for the 1974 harvest, when he launched his now-iconic Insignia bottling. Insignia was essentially the winery’s "reserve" but Phelps didn’t like that word, hence the Insignia name for what was the first proprietary Bordeaux-style blend in Napa Valley. From the start, Insignia was made from the best blocks in the best vineyards at Phelps’s disposal: until 2004, this included a percentage of purchased fruit. But his long-term goal from the start had been to make Insignia from 100% estate fruit and to that end Phelps purchased several prime vineyard blocks over the years located around the Napa Valley. Even though fruit suppliers for Insignia evolved through the years and Phelps’s own vineyards came on line over time, there has been a notable consistency to the core of the wine. Insignia is adamantly not a single-site wine. The quality of the raw materials, the continuity in winemaking, and the winemaking team’s ability to cherry-pick and blend its best fruit are the elements that have enabled remarkable consistency of quality and style—not to mention ageability—as my vertical tasting at the winery in mid-March made clear. Phelps’s first winemaker Walter Schug was responsible for the vintages here through 1982. Some of his earliest Insignia releases have become California legends. Following Schug’s years, Craig Williams was then in charge of winemaking for a quarter-century, first as winemaker and then as director of winemaking, through the spring of 2008. After Sarah Gott, who began working at Joseph Phelps in 1992, made the 2001 vintage under Williams’s direction, Damian Parker, who had been at the winery in a variety of positions since 1981, vinified in 2002 through 2007, with enologist Ashley Hepworth serving as associate winemaker. Hepworth took over responsibility for winemaking in 2008. 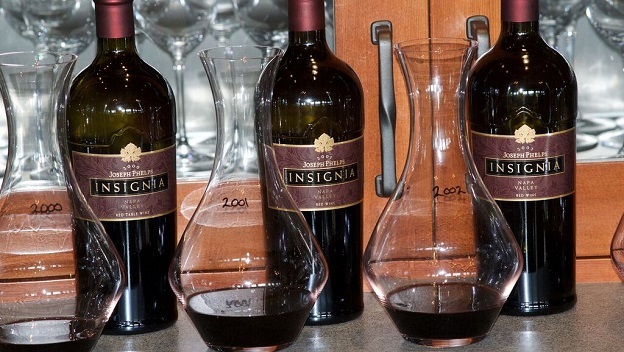 In short, Insignia’s consistency of style has been largely a function of continuity in winemaking. While Hepworth maintained that the Insignia vintages of the ‘70s still retain fruit and backbone, she noted that the wine really rounded into form in the early ‘90s, when the replanted vines in Stags Leap and Rutherford became established. My tasting began with the 1990, and that was the only bottle I sampled that appears to be past its peak. The rest were blazing with vitality. Insignia was made entirely from Cabernet Sauvignon and Merlot in its first few vintages and then a good dollop of Cabernet Franc found its way into the blend. It’s now a five-variety Bordeaux blend, Petit Verdot having been added in 1995 and a bit of Malbec as of vintage 1999. Meanwhile, the use of Merlot has declined to less than 10% in recent years—and in a few vintages none at all—as Joseph Phelps has pulled out 60% of their Merlot, which had been quite tannic and firmly structured. Clearly, another key contributing factor to the reliable excellence of Insignia going back to the early ‘90s has been the broad palate of vineyards with which Phelps works. In hot years, the winemaking team can include more fruit from cooler sites to preserve freshness in the wine—and in order to avoid, or at least minimize, the need to add acidity. In cool growing seasons that might ordinarily produce leaner, or even green, wines, Phelps can increase the percentage of fruit from the warmest spots. (Napa Valley Cabernet-based wines made from a single vineyard are more at the mercy of the weather, and these latter wines will never be as consistent in quality, much less style.) Of course, in the most difficult vintages, Phelps can simply bottle less Insignia. Annual production over the years has averaged around 12,000 cases, but has ranged from 9,000 in 2004 to 18,000 in 2001. As long-time fans of Joseph Phelps Vineyards well know, the winery’s other high-end Cabernet is a site-specific wine made from the Backus Vineyard in Oakville. This 100%-Cabernet Sauvignon wine from a steep, rocky vineyard on the east side of the Silverado Trail is tighter and more dominated by its structure early on, while the Insignia blend is normally more approachable upon release, even if most vintages can improve in bottle for 20 years or more. The Insignia blend has always been put together early—according to Hepworth, it’s 90% finished by the end of the first winter. She seeks to showcase the distinctive character of each vintage but also noted that she is looking for texture. “I didn’t necessarily want to select the ripest components in 2011, for example, because some of our vineyards provided great mouth feel that year at 22 degrees Brix,” she told me. Insignia is frequently glossy, balanced and accessible almost from the start (“it’s a wine meant for aging but one that you can also drink early on,” said Hepworth), but what was most impressive about the wines I tasted at Joseph Phelps in March is that virtually every vintage going back to 2001 is still short of its peak, with the possible exception of the glorious 2004. Phelps does much less acidification nowadays than they did in the ‘80s and ‘90s but pHs in recent years have still been in the very reasonable 3.7 to 3.75 range, or lower than many of California’s richest, ripest cult Cabernets. This has been to their benefit: the wines rarely show roasted-fruit character but they seldom lack for texture or ripeness. I suspect that many Vinous readers have vintages of Phelps Insignia in their cellars. Those of you who do will not be disappointed.